Light and Dark | Live. Learn. Love. Eat. When things are dark, they are not always dark, there is always still light. When things are light, they are never 100% perfect, there is always some darkness. Serafina dumped my new bottle of lemon stevia, a carton of juice, and a carton of almond milk AND peed on the floor twice all within the past 6 hours. My mop sure got a workout today. Serafina also spilled a thing of Cereal all over the living room floor and still crumbles up many of the foods she is given. The side walks are still snow-covered and so we are stuck inside and can’t go out for walks as a family. Serafina also doesn’t keep mitts on and it is too cold for her to go out when she won’t dress properly (or at all). I miss time with Autumn and Kesa alone reading in my bed and being able to actually do things together without having to jump up and check on Serafina or worry about her and autism in the back of my mind constantly. I hate asking for help from the girls too, it makes me feel guilty. I’ve been feeling emotional these days, a little up and down, but not as down as I had been, thanks to yoga, a more cleaned up diet and getting back to spiritual study and practicing gratitude and mindfulness. I miss family meals, but am seeing that maybe it just isn’t a reality any more for most households and accepting that. Cleaning and cleaning and cleaning to no purpose. Sweeping a hundred times a day and endless amounts of dishes and laundry. The attitude of a certain someone with red hair. Annoyance at the fact that she is often imitating me. <— That can drive you crazy! It also teaches that lesson of seeing ourselves reflected back at us through others and to be mindful of our thoughts, words, and actions. The imitation and idealization of a certain someone with strawberry-blonde hair for the certain somebody with red hair who has that attitude sometimes. Using pull-ups and seeing so many go into the landfill. Feeling overwhelmed at times as a stay-at-home mom with little time to reflect on the good and beautiful any more. Feeling a general sadness and loneliness over the fact that it seems that so many people do not care about our world, thought energy and vibrations, and the need for light and love we are meant to bring. No time to sit and relax. Endings. Saying good-bye to the old. I have been able to do yoga in the morning again and go out for walks by myself and listen to Rudolf Steiner. This helps me to clear my head and focus on what I want for our life together. Autumn is doing very well in piano lessons and has such a love for music these days. We have found some time here and there to read, like in the van and when Craig is around to watch Serafina. We are currently reading Jo’s Boys, the fourth book in the Little Women series. Serafina has been mostly happy the past few days, keeping her clothes on more often and going to bed early every night. We are all well-fed and enjoying the food that we have, even if we are having different things to eat. We do all still sit together at the table, even if we are eating different things. I have been trying to buy organic more often again and cut out the girls consumption of sugar, even if it is organic. I cleaned up my room and it has stayed that way for the past 12 hours. Wanting to try cloth training pants for Serafina. Got 3 loads of laundry done. I always make sure that dishes are washed, even if they are sitting in the dish rack waiting to be put away. I have an awesome, loving and patient husband who is also SUCH a great daddy. Massages are appreciated. Learning what matters to me from life’s challenges. I wouldn’t trade any part of my life for something different and love every bit of it, challenges and all. Jason Mraz music. Danicing with my smiling babe. Gratitude for the people who care and who strive to undergo personal transformation to see our world become a better and brighter place for all beings. New beginnings and new opportunities. Saying hello to the new. A chance to transform myself again with new strength to manifest a bright future and inspire others through my life’s example. There is always darkness, but there is also always light. Nothing is ever completely black and white. 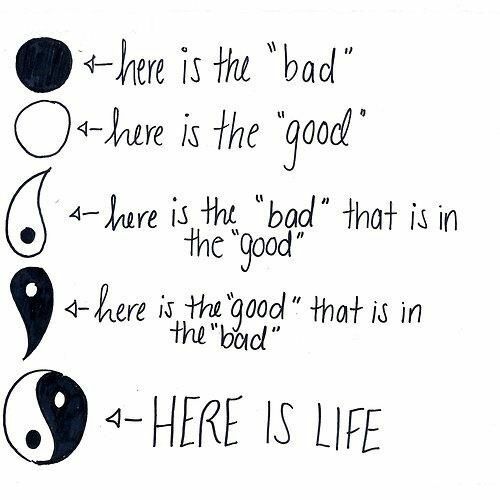 Life is a balance of light and dark and we really do need both. Hope that this has inspired someone else to find their positive perspective. Loved to read this post. I have been overwhelmed with a lot of things past few days so this post is a good inspiration. My plate seems to be overflowing all the time. Lately, I am trying to accept the fact that I am sensitive too. I have been running away from it for all these years. There have been a lot of feelings/thoughts put away in the closet. I am wondering if I actually need to take them out or leave them there. I agree, there is always light and dark in our lives, the hard part is seeing the light through the dark, and you my friend have done just that. It is the practice of seeing the light that reminds us just how blessed we are.